Full size blueprints and complete assembly instructions for our 17/16 Hammered Dulcimer. Detailed prints show you how to build every part needed to build this instrument. Once you have cut out all the parts, use the assembly instructions to put all the pieces together. I thought I would just let you know that I finished my 17/16 hammer dulcimer about a week ago. It took me about a month to build it. The plans I ordered from you were professional, precise and remarkably easy to understand. I used western cedar for the soundboard and baltic birch for the back. I used maple for the bridges and 1/4" oak veneer on the sides, front and back. The tuning took a little time but the end results is a very pleasant sounding heirloom instrument that my daughters and grandchildren will enjoy for many years to come. Thank you very much for these plans and the support you have provided. 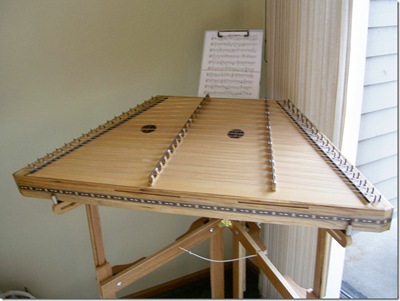 I had spoken to somebody at Musicmakers about our project and how much we appreciated the detailed plans for both the adjustable stand and the 17/16 hammered dulcimer. Your directions were the best that we have ever used for a project and my husband is a shipwright as well as a master cabinet-maker and furniture builder. He followed them right to the letter and as we discussed in an earlier e-mail found them to be dead on accurate. The resultant tone is beautiful.